When it comes to maintaining physique, it’s the little mishaps that tend to add up. A few less reps here, a missed cardio session there. But if left unchecked, all those seemingly insignificant gym details can weigh heavily on your health plan (quite literally) before you know it. But as any avid fitness fanatic will stress, one of the most crucial elements to weight management is organization. Without the proper planning and research performed long before your first gym session, the majority of your efforts will go in vain. And with Strength Training Workout Sheets from allbusinesstemplates.com, individuals can plan and perform a series of muscle-specific weight-lifting routines, all from a single, simple spreadsheet. Keep close track of health status. 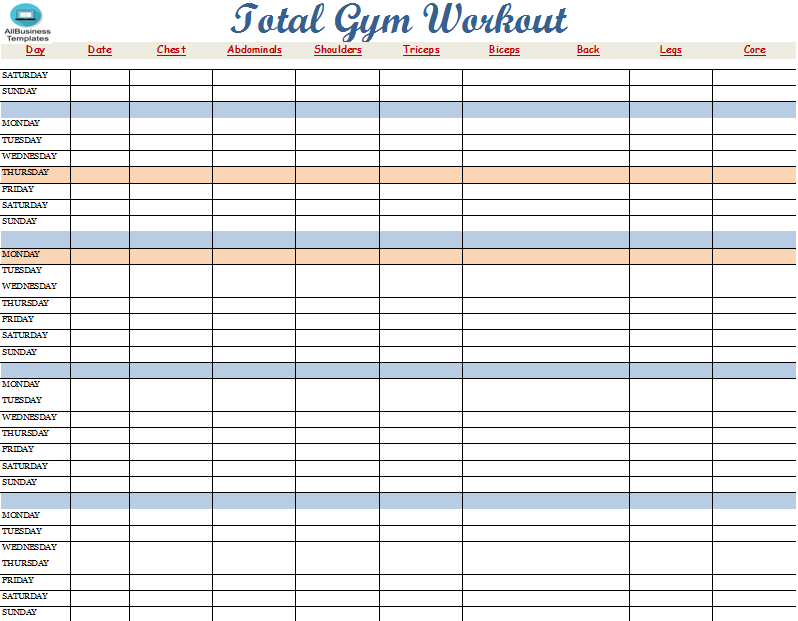 The Total Gym Workout Spreadsheet offers a place to log daily weight and blood sugar levels. Log miles, time and calories burnt on the treadmill. Users can also incorporate pulse and incline levels into their assessment. Strategize effective floor exercises. From planks to jumping jacks, spreadsheet users can plan for a heart-pumping floor routine. Plan a complete weight-lifting session. The Total Gym Workout Plan Spreadsheet includes exercise check-off’s for every major muscle group. What’s more, the template is stratified by days, weeks and months, making long-term gym routine planning a simple, all-inclusive task. The key to any successful workout regimen is variability. Although your gym sessions may start out strong, without any change in pace, your body will adapt and stop improving. But with the Total Gym Workout Plan Spreadsheet, individuals can assess the progress they’ve already made in the gym, as well as plan for the future. Once you adopt a workout regimen for the week, stick with it. Although every ounce of your body might be telling you ‘no’, try your best not to deviate from a workout routine. Although you’ll inevitably switch your style once a plateau nears, try not to miss a single rep or cardio sesh. Don’t forget to diet. Although the Total Gym Workout Plan Spreadsheet can be a vital tool in forming your workout routine, dieting will continue to play an integral role in any weight-loss plan. Always be sure to pack your meals with a sufficient amount of protein and produce to ensure all your nutrient needs are met. Track your Total Gym Workout Plan using this workbook. This workbook contains worksheets to track the different workouts done with your total gym. List all the exercises you do each week and then print and take the workout log with you to the gym each day. DOWNLOAD THIS TOTAL GYM WORKOUT PLAN SHEET FOR FREE NOW!! !